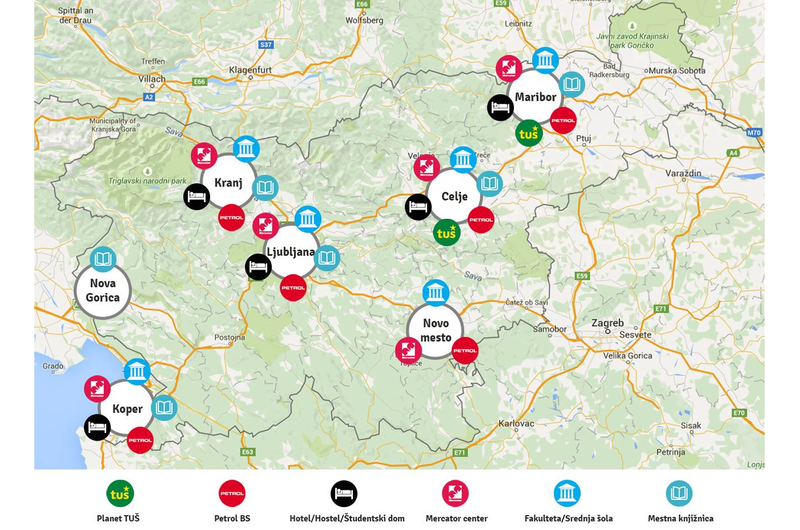 on more than 160 Printbox locations all over Slovenia. and print in colour starting at 4 Euro cent per page. Here’s the list of Printbox location, where you can print 24 hours per day, every day of the week. Do you have the Printbox Android application already? Check out our other Printbox tools. Use Printbox kiosk and protect the environment. Printbox is the result of European knowledge, development and production. Colour printing from 4 Euro cents a page. Printbox is a self-service printing, copying and scanning kiosk available in over 160 locations in Slovenia – in shopping centres, petrol stations, libraries, universities and student residences. You no longer need your own printer and you don’t have to wait in the long lines of the local copy shops any more. 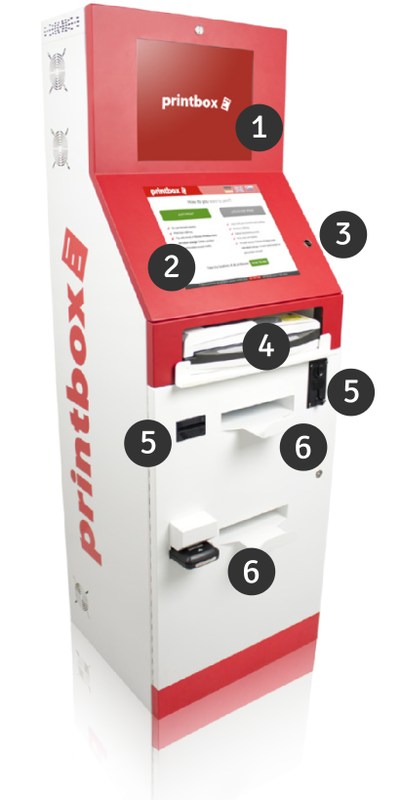 Just look for the nearest Printbox kiosk that is always waiting for you filled with paper and ink, and start printing. Using a Printbox kiosk is simple, and is performed through a touchscreen interface. You can create your own free Printbox user account on a Printbox kiosk free of charge, or print documents without registration. You can load files that you want to print to your Printbox user account from a USB flash drive or via sl.printbox.net , e-mail, Windows program or mobile app. Pay in cash or by Moneta at the Printbox kiosk and start printing. Don’t forget: Printbox kiosk offers you colour printing for the price of black-and-white printing. Other advantages of the Printbox cloud printing system can be seen in the chart below. No app or any other software instalation required. User documents and user information are highly secured. Printbox is not producing any waste cartridges and uses only paper from farmed trees. Users can acces documents at any Printbox kiosk. 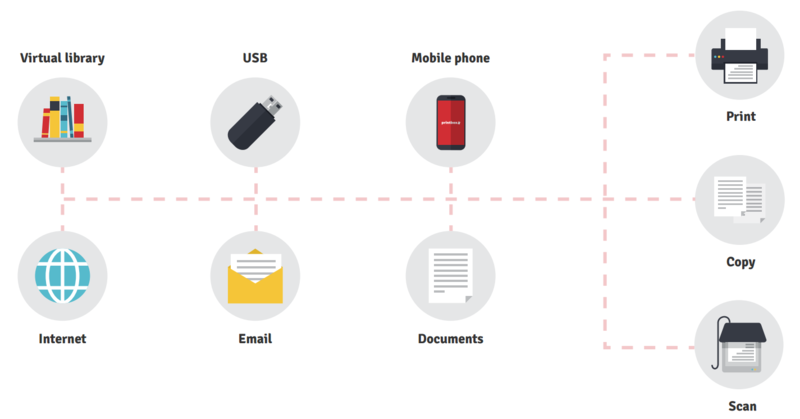 Users can upload documents to their cloud account through mobile phone, tablet or PC. Two separate printers insure twice the speed and realibility. Print, copy and scan in color. Users can scan any document and store it to their cloud account. PDF, Word, Exel, Power Point, JPEG, TIFF, GIF. What does Printbox have to offer? Printbox kiosk is more than just a printer. You can print, copy and scan different types of documents, pay for the services, and store and archive in the user account available on any Printbox kiosk, on the website or mobile application. In all Printbox kiosks you can pay in cash or by Moneta. Credit can be used anytime and anywhere in Printbox kiosks in Slovenia. The Printbox cloud system offers several possibilities to store, send and upload documents, which provides for a user-friendly experience. Read more about the use and operation here. Payments can be made at any Printbox kiosk (cash or Moneta) or with online payment (bank transfer or payment cards). Cloud computing also enables multitude of file storing and uploading options, which makes the user experience so much easier. Printbox virtual library is a collection of free literature that is available to registered and unregistered users in any Printbox kiosk in Slovenia. Where can you find the closest Printbox? 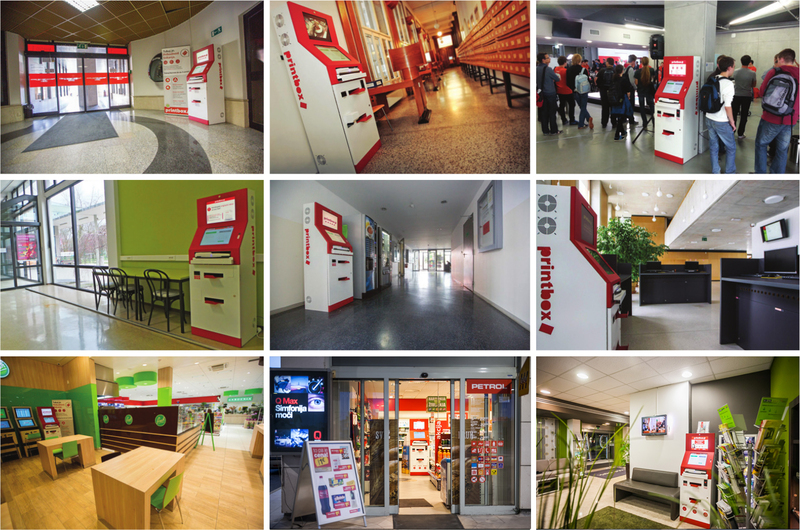 Printbox kiosks are available in over 160 locations in Slovenia. Some locations offer access 24 hours a day, 365 days a year and most of the kiosks are available for the public. Find the nearest Printbox kiosk and try it out. Locations. Read more about Printbox services here. Supports picture and video formats. Fast and easy file upload from USB flash drive. Scanner is installed on a Flatbed. Pay in cash or by Moneta. Here you can pick up your printed documents.